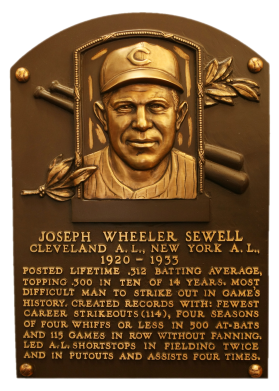 Joe Sewell replaced Ray Chapman in the Cleveland lineup following Chapman's tragic death in 1920. 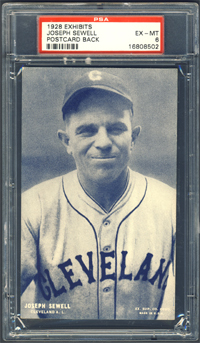 One of the game's best fielding shortstops, Sewell struck out only 114 times in 7,132 at bats. He had 1,141 career runs and 1,051 RBI. 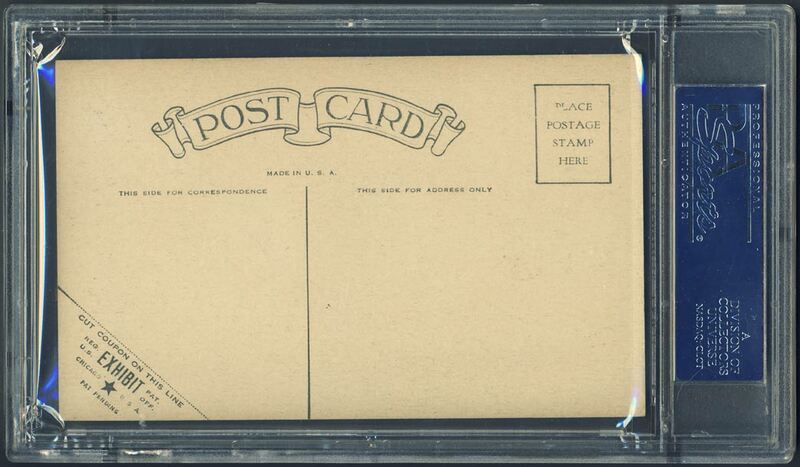 Comments: My records show I purchased a 1933 Goudey Sewell PSA 5 back in October, 2002. I didn't like the card - I thought Sewell looks a little weird. In March, 2005 I replaced it with a 1923 V117 SGC 40 and later upgraded to a PSA 5 after winning a Kevin Savage Auction in December of that year. I liked the card a lot but I also had a Bottomley and Schalk from the same set. 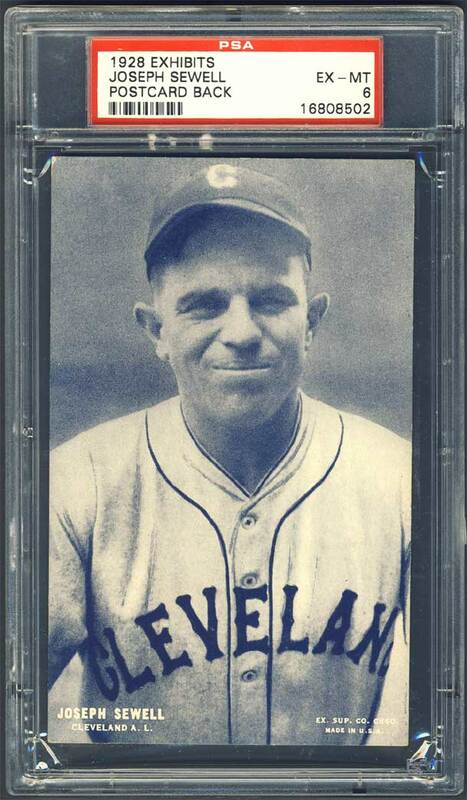 So, I looked for another portrait and found one in the 1928 Exhibits set. In May, 2007 I won a SGC 30 example on eBay. In August, 2008 I upgraded to a PSA 5 (MK) after winning another eBay auction and improved to a PSA 6 (the highest graded) in June, 2010 courtesy of David Bryan. Description: The Exhibit Supply Company switched to a blue tint for the photos in its 64-card set in 1928. There are 36 new photos in the set, including 24 new players. 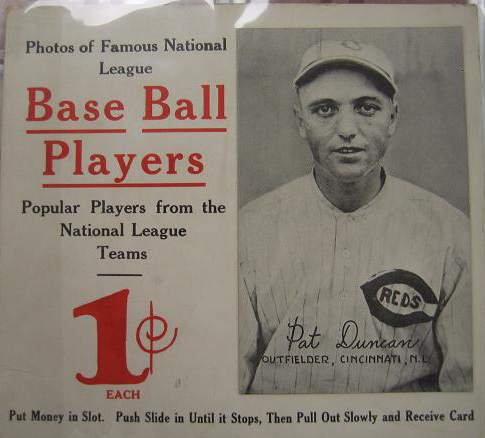 Four players from the previous year are shown with new teams and 24 of the cards are identical to the 1927 series, except for the color of the card. Cards are found with either blank backs or postcard backs. The photos are captioned in the same style as the 1927 set. The set again includes some mispelling and incorrect labels. The cards are unnumbered.